Radiancez Facial Cleanser purifies your skin by removing dead skin cells and excessive oil clog pores which can lead to acne and other skin problems. Contains Virgin Coconut Oil and Argan Oil to improve the moisture and lipid content of your skin while limiting the appearance of stretch marks, under eye circles, burns and wrinkles. Radiancez Day Cream proactively works to keep your skin elastic, plump and supple while fights ageing the natural way. Our unique formula combines the use of foundation, concealer, moisturiser, oil control, skin regeneration, pore-tightening, skin toning and anti-wrinkle; all in one convenient cream. Contains SPF 30 to protect against harmful UV. 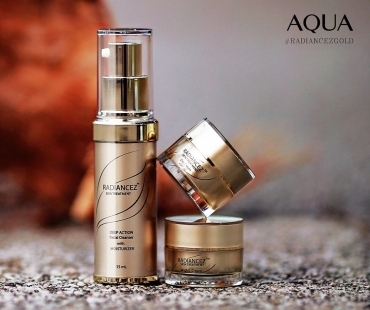 Apply after using Radiancez Facial Cleanser for best effect. Radiancez Night Cream restores, repairs and revitalises your skin when you are asleep by repleneshing it with essential nutrients that were robbed off due to the hassles of everyday life. Combination of Piper Betle extract, Nigella Sativa seed extract and Vitamin E stimulates collagen and elastin production, providing the skin with optimal regeneration and moisturisation. 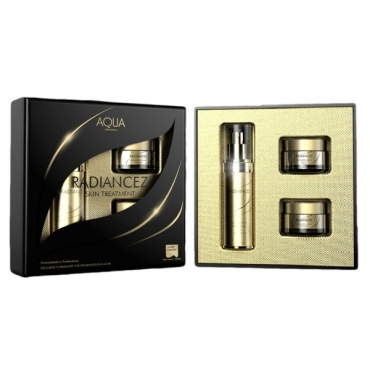 Contains Pure Stem Cell to effectively reduce skin pigmentation and defends against key ageing factors. Australian Tea Tree Oil combats pimples and prevent scarring. Apply after using Radiancez Facial Cleanser for best effect. Radiancez Night Cream memulih dan membaiki kulit anda ketika sedang tidur dengan memberikannya nutrien-nutrien penting yang hilang ketika bekerja di siang hari. Gabungan ekstrak Sireh, biji Habbatus Sauda dan Vitamin E merangsang penghasilan kolagen dan elastin yang memberikan kulit pertumbuhan dan kelembapan optimal. Mengandungi Pure Stem Cell untuk mengurangkan pigmentasi dan melawan tanda-tanda penuaan dengan berkesan. Minyak Tea Tree Australia memerangi jerawat dan jeragat serta menghalang parut dan cela. Untuk kesan terbaik, gunakan selepas menccui muka dengan Radiancez Facial Cleanser.